Yale Young Global Scholars (YYGS) is excited to announce that our Summer 2019 expansion will feature two new, humanities-focused sessions: Literature, Philosophy, & Culture (LPC) and Creative Arts and Media (CAM). 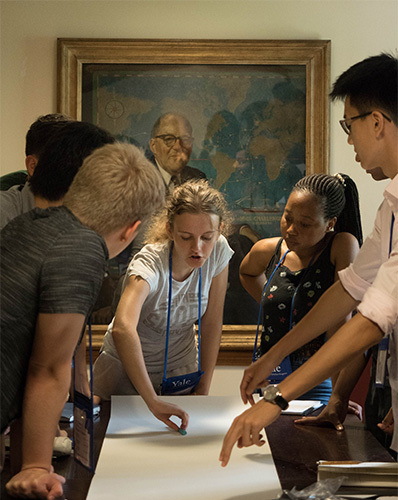 YYGS is an academic enrichment and leadership development program that brings together outstanding high school students from around the world for nine intensive sessions on the Yale campus. YYGS-Beijing: Asia in the 21st Century is administered by Yale Center Beijing and takes place in Beijing, China. The Literature, Philosophy, & Culture (LPC) session is designed for students interested in carefully analyzing written texts and developing their interpretive skills. Students will have the opportunity to explore the relationship between written texts and the culture in which they operate, and the texts will be studied comparatively and globally. This session will help students to think more fluently about their places in the world, and to cultivate their speaking and writing skills in order to better articulate themselves. Engaging with multiple perspectives, students will leave Yale with an awakened awareness of the human condition, ready to reject simple platitudes and work collaboratively and without complacency toward solving both personal and social problems. The Creative Arts and Media (CAM) session is designed for students interested in the expression and interpretation of creativity. Taking advantage of Yale University’s vast musical and artistic resources, students will engage in a variety of genres, including (but not limited to) theater, film, music, architecture, the visual arts, dance, and more. Students will study the histories, practices, vocational opportunities, and interpretative and critical theories of music and the arts, and will refine both their artistic sensibilities and their interpretative skills. Working collaboratively, students will explore the role of creativity both in forming accurate and insightful interpretations of communities, as well as in articulating the possibilities for personal, political, and social action. Students in the LPC and CAM sessions will study topics based upon their preferences. The curriculum will empower students to develop intellectual flexibility and provide opportunities for creative and dynamic approaches to learning and problem solving. “We’re thrilled to expand YYGS this summer to offer these two new sessions, which address widespread student demand for courses in the humanities and arts—fields of study where Yale University has been a worldwide leader for more than three centuries. This expansion will invite an even wider range of students with diverse academic interests to apply to YYGS,” said Ted Wittenstein, Executive Director of YYGS. In addition to the two new sessions, this year YYGS will offer an additional session of Politics, Law, & Economics (PLE) due to popular demand. In all of the nine YYGS sessions based in New Haven, students will attend lectures by Yale faculty, as well as smaller, more intimate seminars taught by YYGS instructional staff. Over the course of each two-week session, students will work in Capstone project groups to complete two-week, research-based or creative projects that will culminate in a final presentation or performance. YYGS is a residential program hosted in Yale’s residential colleges. Students admitted into this highly-selective program get a taste of the Yale experience through the use of Yale libraries, classrooms, dining halls, dorms, and more. With the addition of these two inaugural sessions, YYGS will be offering a total of ten intensive, interdisciplinary, summer pre-collegiate experiences for 2019. Brief descriptions for each of the ten sessions are listed below. In ASE, students explore interdisciplinary scientific applications ranging from the nanoscopic to the astronomical in scale. This session is designed for students who are interested in learning how to apply scientific and design principles to practical applications, challenging them to examine the world around them as scientists. In IAG, students tackle pressing questions in international relations and examine the effects of globalization on communities around the world. They explore a variety of contemporary and historical issues and are challenged to think critically about complex international dilemmas related to a broad range of topics, including conflict and cooperation across borders, international law, human rights, and identity. In SDSE, students develop the practical and adaptive tools of an entrepreneur to address contemporary social and economic problems. Students are immersed in the interdisciplinary study and active problem solving of issues involving economic development, poverty alleviation, human rights, and environmental protection. In FST, students examine innovative developments at the forefront of science and technology. This session is designed for students looking to explore the convergence of interdisciplinary fields such as artificial intelligence, gene editing, big data, cyber security, and renewable energy. In LPC, students follow a close reading of a culturally significant text and explore the relationship between these written texts and the culture in which they operate. This session is designed for students interested in careful analysis of written texts and the development of their interpretative skills. In PLE, students learn key ideas in topics such as public policy, human rights, market regulation, governance structures, and international law. The session enables students to examine social systems and present day issues through the lenses of economic, legal, and political theory. In BBS, students explore interdisciplinary scientific disciplines such as epidemiology, biochemistry, neuroscience, ecology, and systems biology. This session is for students who want to delve deeper into the study of the life sciences and their applications. In CAM, students study the histories, practices, interpretative and critical theories, and vocational opportunities of music and the arts in order to explore the role of creativity both in forming accurate and insightful interpretations of communities, as well as in articulating the possibilities for personal, political, and social action. This session is designed for students with an interest in the expression and interpretation of creativity. In ATC, students examine the cultures, histories, societies, politics, and economies of a wide range of Asian countries and analyze their influence on development at a national and international level. This session is for students interested in gaining a deeper understanding of the unique economic, development, and security challenges within the Asia region. The online application is now available and accessible through the YYGS website. The application deadline is February 6, 2019, at 11:59PM EST. Need-based scholarships are available and students from all financial backgrounds are encouraged to apply. Last year, over 1/3 of admitted students received some form of financial assistance. For additional information, visit globalscholars.yale.edu or contact us here.